It’s been a month!? Goodness! Well, yes, it’s summer, and I’m trying to enjoy it and be productive with some goals at the same time. So here I am. So I do have a follow-up question that is something that I’ve been dealing with lately. While there is no judgment, does that mean you still think that being gay is necessarily a “bad trait”? For example, you wouldn’t judge thieves, but you wouldn’t promote their behavior as positive and godly. Any thoughts? Okay. Here I am. Honestly…your question is something that I have struggled with thinking through sometimes. However, after thought and reflection, I cannot bring myself to a “love the sinner, hate the sin” mentality. I just can’t. I can’t tell someone that I love them or that God loves them but, in the same breath, call them wrong. I have done too much wrong in my own life to pass judgment. Do people do things that are wrong? Yes, we all do. But if I’m so busy judging or telling someone their faults or, as you put it, bad traits, there’s no room left to love them or for them to BELIEVE that I love them. I am not God. I don’t know His mind. I don’t know the minds of any other person on this planet. 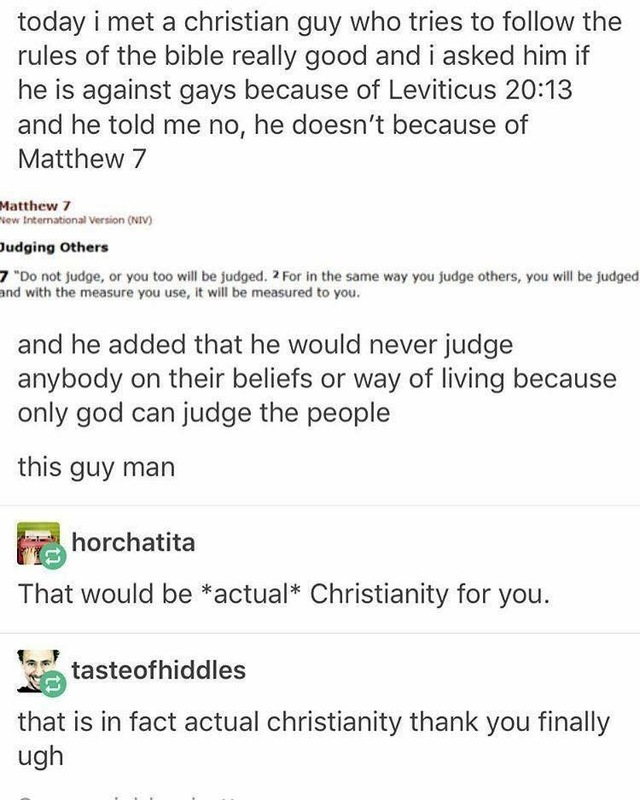 I am not called to judge. I am called to love. To love all of someone. Do I want to help people grow in life? Yes, I want to encourage, support, and help them in that growth, whatever that may mean for them. I will love and pray for them, no matter what. What immediately springs to mind (and sticks there) for me is John 8:1-11 and I’ve quoted it below. Jesus didn’t condemn this woman; He didn’t judge her. He said, “Go and sin no more.” He didn’t lay her sins, whatever they may have been, out before her. He doesn’t tell her what’s wrong with her or bad about her. No. He just told her that He didn’t condemn her, to go live her life and do what’s right. In the same way, I will not condemn someone. I will not lay what I, in my fallibility, think are their sins before them. I am called to love and I will love and love and love. I will do what I can to help those I come into contact with to live the best lives they can in the spaces they are in. I have been so deeply loved in my life, have met and known and loved so many amazing people from all walks of life, but I have also seen what damage and pain and separation condemnation and judgment can cause. Such things are not of God and I will not perpetuate such pain. The Church is called to love God and love others. This is most important and it is what I have built my life on and will continue to. To be sure I answer your question, no, I do not think that being gay is a “bad trait”. Some of the greatest people of faith I’ve ever known are gay, and I will thank God for them from the rooftops and point those who need love and prayer and counsel to them all the time as people of God and some of the deepest, strongest, and most loving Christians I have ever known. Thank you for asking and making me think, love. 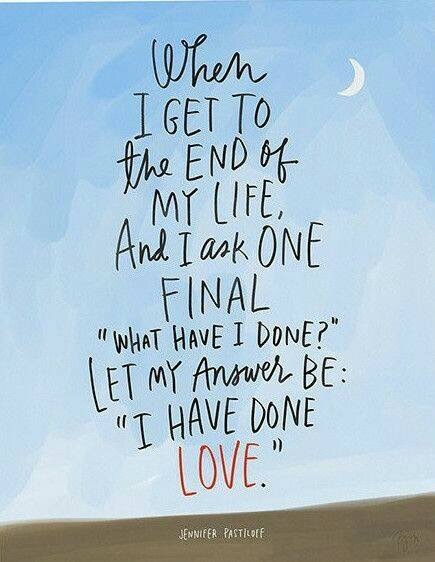 I am called to love and loving is what I will do. It’s Mother’s Day. Yes, it’s for you, too. It’s for those whose children who will bring you breakfast in bed. It’s for those whose babies wake up screaming or whimpering in pain in their hospital bed. It’s for those who are just getting off third shift to kiss your kiddos good morning. It’s for those who will lay flowers at a headstone with dates all too close together. It’s for those whose arms were so close to being full and whose tender hearts are slow to healing. It’s for those whose arms are still empty and whose full hearts ache. It’s for those with no children of their own but who spend their days caring for and loving on those others. It’s for those who take little ones not of their own blood into their homes and hearts. Yes, they are yours. You are mothers, all of you. Today and every day, I salute you. For those who have loved and mothered me throughout my life and who now love on and mother my child while I am at work, today and every day, I thank you. For those who are sharply missing your mother, today and every day, I love you. Yesterday was that most celebrated and simultaneously dreaded and reviled of days: Valentine’s Day. I know some people who love it, others who disagree with it, boycott it, or downright hate it, all for different and likely very valid reasons. I personally don’t mind it. It gives me an excuse to do what I enjoy doing anyway: letting people know that they are cared for, loved, and appreciated. In college, I bought carnations from one of the sororities and had them sent around campus to my friends. I snuck around dorms, leaving parcels of fresh-baked cookies or sliding cards under doors. Nowadays, I send letters and cards through the mail, few to none of them necessarily red or pink or covered in hearts. I sometimes send flowers, goodie/snack baskets, books, or coveted t-shirts. This year, I bought my husband a card about cuddling up and binge-watching our favorite show, along with a copy of the latest season of “The Big Bang Theory” so we could do just that. He bought me a DVD of a show that I have been looking forward to, too. I bought my daughter some cute outfits for her first Valentine’s Day party at preschool and a card with a spring-loaded heart inside, which she played with and covered in stickers all evening. Yes, the day has become commercialized. Yes, the keeping of it has become social expectation. Yes, some people try to front-load affection, love, kindness, etc., and then let it lapse the rest of the year. For some, this day is a day of bitter memory, of hurts tied not to the day itself but to the events of one or several Valentine’s Days. Unfortunately, over time, those bitter cords have attached themselves to the day itself. The circumstances have perhaps faded into oblivion, leaving only the day to stand as a bastion of misery and thus worthy of boycotting. Again, people’s reasons are valid and they are free to do as they will. Whose heart can I make smile today? Who can I remind that they are loved today? Who needs a reminder of the good that they have done that I’m grateful for? Who could just use a kind word on what might be a lonely day? For me, Valentine’s Day isn’t an obligation, it isn’t a burden. It’s an opportunity–for love, for encouragement, for gentleness. But that’s just the way I see it. I hope yours was good to you. Last weekend, I listened to speaker Bill Hybels talk about passion. One of the questions he asked was, “Where does your passion come from? A beautiful dream or a holy discontent?” I was more than a bit fascinated by the phrase “holy discontent”. Can discontentment be holy? Then Mr. Hybels explained. Sometimes our passion can come from a complete and utter discontentment with the way things are, along with an inability to leave things the way they are. We simply must do something about it, so our passion is born in and borne out through this discontentment. I realized that I live in a state of holy discontent. That is where my passion wells from. I am utterly discontent with how much of a lack of love, mercy, and grace there is in how people treat each other in our world. I cannot let things stay that way. I see people hurting, pieces of hearts broken off, cracks gaping in souls. I cannot let things stay that way. I cannot let those who are hurting remain in their pain alone without holding their hand and telling them that they are safe to feel as they feel. I cannot let those with broken hearts suffer without knowing that they are loved, cared for, and considered worthy. I will not let those with gaping souls go hungry without telling them that God calls them good, wonderful, and beloved. And so do I. My passion for hearts, my soul for people, is born out of a holy discontent. I believe that God has allowed this particular seed of discontent in my soul with the aim of fueling me to fulfill the purpose for which I was created: to love big. God has filled me dissatisfaction in seeing the lack of love in the world, and He pushes my heart to offer it. Day after day, as much as I can: love, encouragement, mercy, and grace. There are people who walk around each day, dear ones and strangers, with broken hearts, cracked souls, and empty eyes. People who think themselves failures, unlovable, alone, and bereft. People who are suffering, and I cannot stand it. The heart that God has given me yearns to see souls, people, dear ones, strangers, live loved. I want to help others breathe a little more easily and deeply. I want to respond with grace, gentleness, truth, and love. I want people, you precious people whom God has made, to know that you matter, you are significant, you are beloved, and were created with a unique purpose in mind. Yes, each of you. You are here on purpose. My passion is not one that is big (well, it is–to me. But not like attention-getting big, I mean.). It is not one that is loud, will make me famous, or maybe birth a movement. I do not lead workshops. I haven’t written books. And that’s okay. I do what I do. I post, I call, I listen, I write, I pray, I hold hands, and I give hugs (and mugs of coffee/tea/hot chocolate). These are small things, but please don’t underestimate the small things you can do. They can effect monumental change in a person’s life and soul. I am living proof. What is your passion in this life? Where does it come from? Are you working towards a beautiful dream or are you striving to change the source of your discontent? And, yes, these things that you see wrong with the world: that is indeed a holy discontent. Perhaps you feel that your passion is not that big. Not big enough for people to pay attention, not big enough to make a difference. Please, hear me when I tell you this: it is! Your passion is big enough. The small things you do are big enough. The steps you take in your passion are big enough. Yes, they are! Keep dreaming, keep doing, keep stepping. My passion is born of a holy discontent. A discontentment with a world lacking in goodness and love. I want to find it, highlight it, give it, infuse it. I want to change the world. I want to see love change the world. I want to be a love that changes the world. Let love be the overwhelming response to and result of my holy discontent. 2016 is almost over and what a year it’s been. I’m not entirely sure what to make of it now that I sit and think about it but I will try to put word to thought. This year, my watchword was grace—to give grace as well as to recognize it when it is given me and to also give it to myself. I have spent this year trying to be mindful of opportunities to show grace, as well as to accept it when I receive it. I also worked to be mindful of opportunities to study and explore grace and its facets. This year, I spent my NaBloPoMo (National Blog Posting Month) in November centering my writings on grace. I explored what I knew, what I have experienced, though, and considered, and even found new levels of thought on what it means to give grace, experience it, choose it, and even to be graceless. It was, honestly, one of the best writing experiences of my life and it renewed a desire in me to write, and I am determined to write as often and as much as possible in the coming year. This year, I went back to teaching full time. It was a quick decision after many, many applications, interviews, and then coming to terms with being home with Elizabeth for a final year. I got a call, interviewed, and made a decision all in two to three days. I had to sacrifice some things, such as seeing my baby off on her first day of daycare/preschool, but I knew that it was the right decision for my family. Has it been easy, such a quick and large life transition? No, not really, and it has taken me almost the entire semester to feel as though I have found my feet or that I belong in teaching again (still not entirely sure on the latter but for now, functional will do). 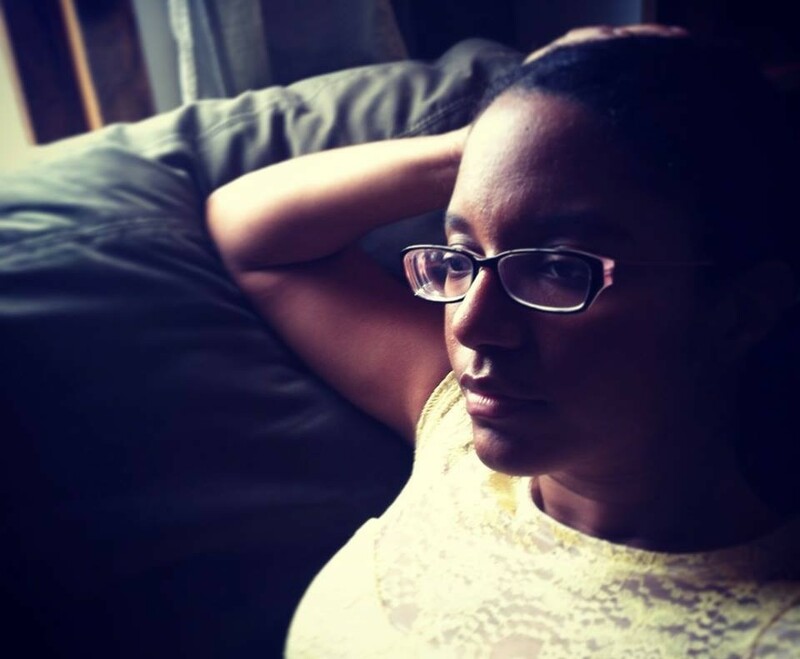 I am still struggling a bit to find a life balance again—to find the correct levels in time for daughter, husband, my self-care, and my writing–but I have learned and am learning a great deal from the teachers and students I am working with now. At the same time, my girl is enjoying school and missing her friends now that we are at the tail end of Christmas vacation. She is doing wonderfully, growing quickly, learning so very much, and I am thankful beyond measure for that. My husband has just completed a leadership development program, which I am buttons-bursting proud of him for sticking with. I know that it was a testing for him and I am ever so proud of his perseverance and determination to get everything out of it that he could. He works hard each and every day and gives all he can as a teacher and a pastor and I am constantly awed and inspired by him. This year, we celebrated ten years of marriage surrounded by friends and full of laughter and good food. It was the best method by which to celebrate (well, that and the new Star Trek film) and I am so glad that we were able to do so. I love you, darling, today and every day and even beyond that. As 2016 ends, I have been thinking and praying about a watchword, a word of intention for the coming year. This year’s word was grace and the year before was intentioned by courage and kindness. So far, the word that has come to me is gentleness. What does it mean to be gentle? To act and react, listen, speak, and be with gentleness? With all the fear, the worry, the anger, the darkness, what does it mean for me to be gentle? How can I be gentle with the hearts that are afraid and hurting? How can I be gentle with those who do not understand or don’t want to? How can I be gentle with my dear ones? Gentle with their feelings, their thoughts, with honesty, in my reactions and discipline as we raise our daughter, with my loved ones’ precious hearts and souls? How can I be gentle in my job, with my students and coworkers, with their humanity that may break out in difficult ways sometimes, much like my own? How can I be gentle in my faith, in speaking love and kindness and giving grace to others? In following the example of the God I claim to believe in and the Jesus I claim to follow? How can I show gentleness in my craft, in what I write and how I post on social media, the corners that I build in the world around me, both real and online? How can I be gentle and bold and courageous at the same time? I want to hold what people give me, what they trust me with, gingerly and carefully. I want to be gentle with souls, with words, with trust, with hearts and feelings. I want to do this for others because I know how much I want it for me. I want people to be gentle with me, with my thoughts, feelings, words, hopes, dreams, heart, and soul. Just as I know how much I need grace and so I try to give it, so it goes with gentleness. I know how much I desire it; why should others not be the same? Why should I not try to give the reactions that I would want to receive? Everyone is going through or has gone through something; everyone could use some gentleness in a world so rough and tumble. This year may be hard, this year may be scary, but I will not let that stop me. I will not let it harden me either. I will not let it take my softness away but, if anything, I will let it increase, let it seep into my touch, fill my words, prompt me to listen more than I speak. May this coming year find me holding others with gentleness and radical love, continuing to act in grace, having courage, and being kind. Welcome, 2017. I call you blessed and look forward to what we have to learn together.